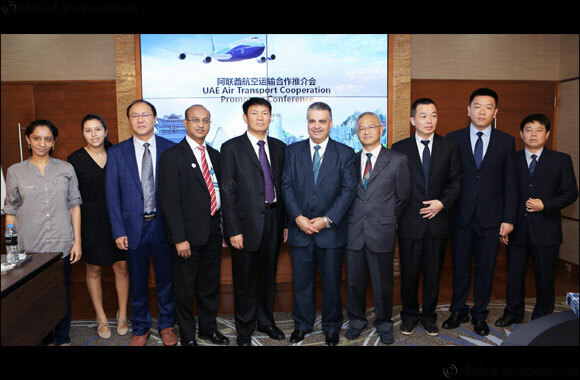 Dubai, UAE, October 6, 2018: Chinese carrier Uni-top Airlines is planning to operate B747 freighter flight between Kunming in China and Dubai, according to Mr Yang Fan, Vice President of Uni-top Airlines. The Chinese carrier currently operates B747F and A300F. Mr Joe Beydoun, Head of Cargo Business Relationships Commercial & Communications of Dubai Airports, who attended the UAE Air Transport Cooperation Promotion Conference organised by a delegation of the Yunnan Provincial Development and Reform Commission, expressed full support from Dubai Airports for those operations. “Chinese President Xi Jinping visited the UAE in July, and the leaders of the two countries unanimously decided to upgrade bilateral relations to a comprehensive strategic partnership. We expect to strengthen joint marketing promotion for airline flights, tourism market and especially air cargo market in order to push the development of bilateral economy and trade, and we also expect to promote abundant green agricultural products with Yunnan plateau characteristics to the UAE for sharing,” he said. “We had a meeting with Capt. Khalid Humaid Al Ali the Director Air Transport Department of the General Civil Aviation Authority of UAE, and he welcomed more flights between airports in UAE and Yunnan province,” he said. “I believe that the two sides will fully participate the 'Belt and Road' construction, build an air silk way, promote interconnection and intercommunication, play complementary advantages, stimulate trade vitality, foster the cooperation and win-win sails, work together in the same boat, cooperate sincerely, and write a new chapter of friendly air transportation cooperation,” he added. Yunnan province is China’s major tourist and agricultural province, with extremely rich natural resources and abundant plateau green ecological agricultural products. There were more than 580 million visitors to Yunnan and US$4.8 billion of agricultural products such as tea, coffee, vegetables and fruits have been exported in 2017. The Civil Aviation Administration of China (CAAC) and the Yunnan Provincial Government have jointly signed ‘The Kunming International Aviation Hub Strategic Planning’, in order to build Kunming Changshui international airport into an international hub that is safe, efficient, accessible, integrated, green and intelligent. It is planned that by 2030, there will be 500 air routes including 200 international and regional routes with 120 million passengers and 1.78 million tons cargo by running 5 runways in Kunming Changshui international airport. The Chinese delegation included Mr Lu Xuesong, Mr Xiao Zhiwen, Mr Zhang Bo and Mr Yang Zesong from the Government of Yunnan Province, and Mr Feng Feishi from Uni-top Airlines. More than 20 traders, cargo agents and media attended the promotion conference.